A sub-elite swimmer that races the 400 free in 4:00.00 expends 147 kcal (35g of carbs and 0.32g of fat will be fueled). It is the Christmas season and it being New Years Eve [actually Super Bowl time for the republication], people fly back home to be with the loved ones (and have a lot of food), schedule meetings with old friends (over a meal), bond with peers and colleagues (with the excuse of a… exactly …a snack and a drink). On the flip side, the number, volume and intensity of the training sessions tend to change. One concern of most coaches during the holiday season is the swimmers’ food intake and the lack of workout. Weight depends from the balance between the total energy expenditure and the total energy intake. One loses weight if the expenditure is higher than the intake. Otherwise, if the expenditure is lower than the intake s/he will put some weight. Total energy expenditure (to calculate how many calories you burn when swimming) is the sum of the: (i) resting metabolism (i.e, to sustain basic chemical processes and keep the body working); (ii) physical activity (including physical daily routines plus exercise & workout) and; (iii) thermic effect of food (i.e., the energy needed to digest food). Energy can be measured in Joules or calories. Most of us are familiar with the calories as units of measure. One calorie is the quantity of heat needed to raise the temperature of 1 kg (1 L) of water 1°C. The three major macronutrients are: (i) proteins (it has 4kcal per gram); (ii) lipids (also 4 kcal per gram) and; (iii) carbohydrate (9kcal per gram). As we can see the carbs are the most energetic nutrient. 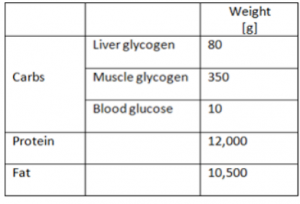 Table 1 shows the amount of energy stores for an “average” subject with 70 kg and a fat content of 15% of body weight (adapted from Maughan and Burke, 2002). FYI, it is not hard to find swimmers with around 70 kg and 15% of fat mass. Table 1. Energy stores in the average man (adapted from Maughan and Burke, 2002). Now let’s bridge all these with competitive swimming. Comparing the energy expenditure for a given speed, front-crawl is the most economical stroke, followed respectively by the backstroke, butterfly stroke and lastly the breaststroke (Barbosa et al., 2006). We are comparing the four strokes at the same absolute speed. If we would ask someone to swim at a self-selected speed, i.e. a comfortable speed with a nice and easy technique, things could be slightly different. Since the comfortable speed at breaststroke is lower than butterfly, likewise the energy expenditure would be also lower. That is why non-expert subjects, such as fitness-oriented swimmers are most keen to swimming breaststroke rather than butterfly. In this sense, energy expenditure also depends from the competitive level (Fernandes et al., 2006). The substrates or macronutrients fueled can be indirectly estimated measuring the carbon dioxide production (VCO2) and the oxygen consumption (VO2) with a metabolic cart. The ratio VCO2/VO2 is termed “respiratory exchange ratio” (RER) and gives an estimation of the amount of energy being fuelled with origin in fats or carbs. We can learn about the energy needed to complete a training session or even a race knowing the swim speed, the distance and the RER. Having those as input data it is possible to calculate the energy cost. The energy cost is the amount of energy that we expended to swim one meter. I invite you to download the spreadsheet attached to this post and play with it. Calculations are based on a description found in the literature (Zamparo and Bonifazi, 2013). 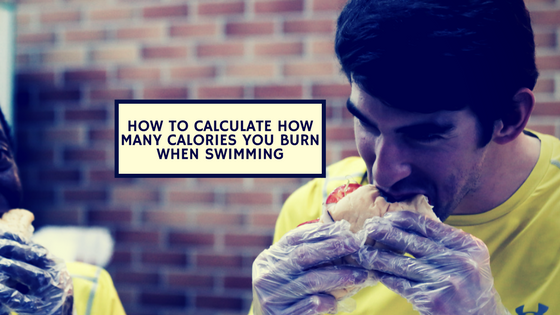 A couple of examples how to put together the calculations and interpret the data to calculate how many calories you burn when swimming. Training volume: I had a training session of 3,000 meters with the main goal of eliciting the aerobic capacity at front crawl. Sets like 15 x 100m @ 65 seconds. Therefore, I will key-in in the excel sheet (red cells on the top) a speed of 1.54 m/s, a distance of 3,000m and a RER of 0.85. The total energy cost of this session was 1,088.55 kcal (blue cells in the middle). Meaning that it was fueled 126.64 grams of carbs and 61.09 grams of fat (blue shaded cells on the bottom). Swim race: Another example is how much subtracts are fueled in a race. I raced the 400 free with a final time of four minutes sharp (240s, i.e. an average speed of 1.67 m/s). The RER for swim paces close to aerobic power (as happens for swim races that takes around four minutes) according to instructions in the spreadsheet is RER=1.0. In this case, the energy cost of the 400 free race was 146.55 kcal (34.94g of carbs and 0.32g of fat). I would like to call your attention that this spreadsheet does not substitute the advising of a certificated professional. Only provide us a very rough estimation of the energy fueled during the workout. The energy needed for basal metabolism, physical daily routines and thermic effect of food are not computed. Besides that, after exercise energy expenditure remains high for at least 4 hours (Kuo et al., 2005). Others reported this effect for a longer period of time, up to 24h (LaForgia et al., 2006). The post-exercise expenditure increases mainly the fat consumption (i.e. lipid oxidation). Good news for fitness-oriented people willing to lose weight. They are burning calories not only during the workout but also (at a much lower rate though) a few hours later. Anyway, if that’s the case, have a safe trip back home, enjoy the meals that brings back memories of your childhood, a merry Christmas and a very happy new year to each and everyone of you! [below is an example of the attached link for the program above to calculate how many calories you burn when swimming]. Written by Tiago M. Barbosa earned a PhD degree in Sport Sciences and holds a position at the Nanyang Technological University, Singapore.